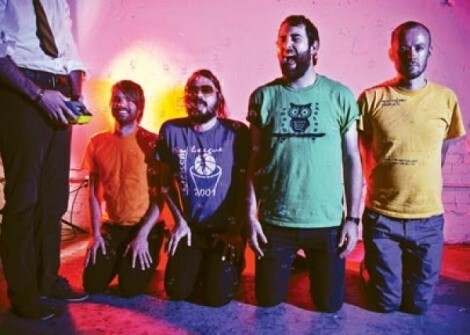 Colourmusic shares more than the home state of Oklahoma with the Flaming Lips. They’ve shared the stage on multiple occasions, and they share an unrelenting work ethic and desire to create experimental music. For Colourmusic, each tone, chord and melody has a mood that is associated with a color. Since their inception in 2005, with color as their guiding principle, they released collections of songs about red, yellow and orange. They followed up this year with My ____ is Pink. “The color definitely comes first,” Colourmusic drummer Nick Ley explains of their creative process. “We’ll ask ourselves, for example, ‘What does pink mean? What does it sound like?’ ” They answer the question with guitars, vocals, bass and drums. “So it’s our own subjective definition of that color, but we are able to use it as a guideline to debate and sharpen the sound of our project,” he says. On My ____ is Pink, the resulting product is a hard-rocking, yet somber sound dominated by droning guitar chords, sparse yet lyrical drumming, bass melodies and reverb-hued vocal harmonies. Each song has a vocal hook that could land them on commercial radio. But this band might be too experimental for such a fate. Their live performance is equally experimental. Band members perform in body paint and suits that correspond with the music’s color themes. When Flaming Lips frontman Wayne Coyne heard of their onstage theatrics, he invited them to play a few gigs with the Lips. “Since then, we’ve had various interactions with Wayne [Coyne],” Ley says. They’ve played numerous gigs together, including a Tonight Show segment hosted by Wayne Coyne in Austin during SXSW in 2007. The Coyne/Colourmusic connection continued in the recent video for the song “Tog,” from My ____ is Pink. Coyne added support by covering the crowd with colored goo during the video. Aside from goo-spraying skills, Coyne and company act as godfathers to the local scene. “The greatest thing about the Lips is the example they set for other Oklahoma bands. Their insane work ethic, creative and ambitious albums and unbeatable live show made us aim for their level of success from the beginning,” Ley says. And Colourmusic is continually raising their own bar. The color-album project is ambitious, and the band works endlessly to hone their sound and their live performance.